Morgan was married twice. She had two children, a son and a daughter, with first husband Sherwood Morgan Sr., who died in 1948. She then married Stanley Kirkaldy, with whom she ran a child-care center in Queens, NY. She received her bachelor's degree from St. John’s University when she was 68 years old. Five years later Morgan earned a master's degree in Urban Studies from Queens College. The bus driver stopped in Middlesex County, Virginia, and summoned the sheriff. When he tried to arrest Morgan, she tore up the arrest warrant, kicked the sheriff in the groin, and fought with the deputy who tried to pull her off the bus. 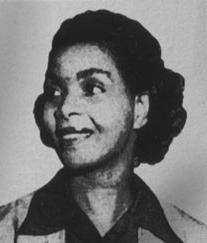 She was convicted of violating state law for segregation on buses and other public transportation. Morgan pleaded guilty to the charge of resisting arrest and was fined $100. However, she refused the guilty plea for violating Virginia's segregation law. ↑ Goldstein, Richard (13 August 2007). "Irene Morgan Kirkaldy, 90, Rights Pioneer, Dies". The New York Times. Retrieved 25 March 2013. ↑ "Morgan v. Virginia (1946)". www.encyclopediavirginia.org. Retrieved 2015-11-04. 1 2 Lamb, Yvonne S. "Irene M. Kirkaldy; Case Spurred Freedom Rides." The Washington Post 13 Aug. 2007: n. pag. Print. ↑ "Morgan v. Commonwealth (June 6, 1945)". www.encyclopediavirginia.org. Retrieved 2015-11-04. 1 2 "Milestones," August 27, 2007 edition of TIME Magazine at p. 23. ↑ Photo of "Washington Afro-American" headline with 6-1 Supreme Court vote. ↑ "Morgan v. Virginia (June 3, 1946)". www.encyclopediavirginia.org. Retrieved 2015-11-04. ↑ "Maryland Women's Hall of Fame". MWHF. Retrieved July 27, 2012.